This is the brand of cat litter I use anyway but I love the light weight since it's easy to carry and easy to pour and it works great. I received a coupon for Tidy Cats Lightweight from PinchMe recently. I used the coupon on a jug at Safeway. The jug was lighter than the 20 lb normal clumping litters so was easy to handle. It worked fine in the litter box but seemed too dusty. This product is really great. 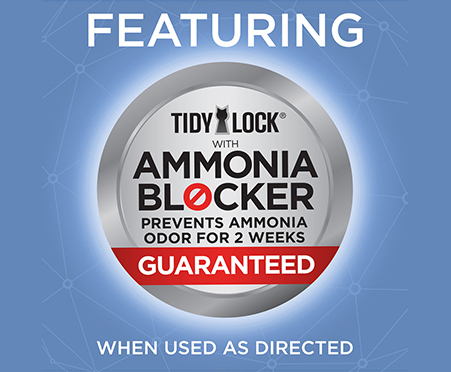 Not only does it work instantly to block orders, but it keeps the ammonia smell at bay. It's so lightweight and easy to transport. Highly recommend!!! My cat really enjoys this litter. And so do I. It blocks the urine smell much better than any other cat litter. No more buying air fresheners to sit around the litter box and throughout our home. Highly recommended in the jug for easy carrying and use. I feel like the tidy cat lightweight cat litter is roughly the same as their other products as far as effectiveness but I love how lightweight it is. Tidy Cats is one of my favorite brands and I loved the tidy cats lightweight!! It was so easy to carry from the store to my house and simple to pour right into the litter box. We love Tidy Cats litter. It was a treat to be able to try Tidy Cats Lightweight litter. It was so light! Made carrying the jug so easy and pouring it a breeze. Works wonderfully too! Easy to scoop and smells fresh. Thank you for the coupon for today cats. It's a great product. I love Tidy Cats litter by Purina! 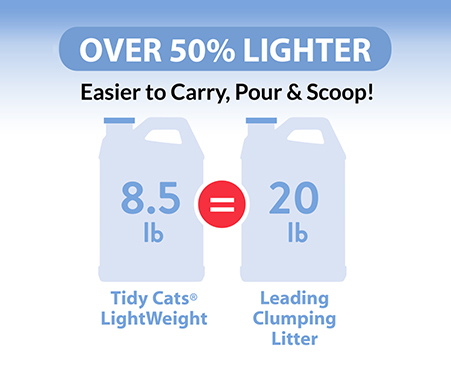 The Tidy Cats Lightweight litter is an improvement on an already great product! It performs so well, and is now easier to handle! I love the Tidy Cats Lightweight cat litter. 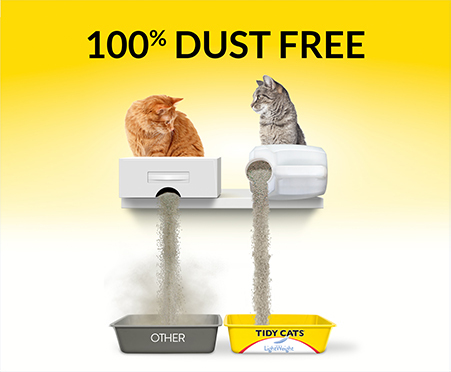 Tidy Cats is my go-to brand for litter because it works the best at reducing the odor of the litter box. In particular, I really love the Lightweight variety because it is so much easier to transport when purchasing and to pour into the litter box. 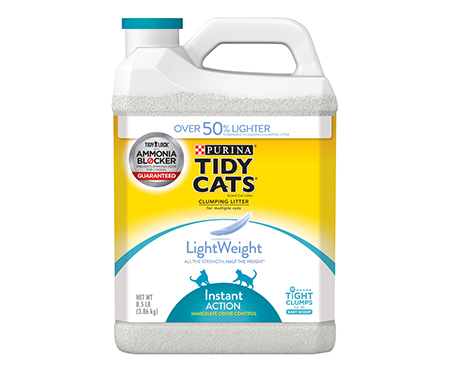 Tidy Cats Lightweight litter is great to use for multiple cat families. It provides excellent odor control as well as easy to carry from store to home. Having been a clay litter user for our cats I decided to try the scoopable litter to test the difference. Found it to be easier in some respects-less to vacuum up around boxes but more time consuming picking out the clumps periodically. I love Tidy Cats Lightweight litter. It is the only brand I will use. We have 3 cats and this is the only product I trust to keep my house smelling like I do not have a cat. Easy to use, carry and buy. I received a coupon for a complimentary jug of Tidy Cats litter. I got the Tidy Cats Lightweight and I'm so glad I did! First of all, it is so light weight! the jug makes it easy to pour litter into the litter box without making a mess, and you can smell the freshness as soon as you pour it in. It clumps really easy and my cat likes it too! I absolutely love how light the Tidy Cats Lightweight product is! It is amazing! This " Tidy Cats Light weight litter " worked out a lot better than i expected , it smells AMAZING and clumps like a pro ! I would say buy it ! it's lightweight like they said and worth it ! I received a coupon for Tidy Cats Lightweight cat litter through the PINCHme sample program. Tidy Cats is the best cat litter brand I have tried. It controls odors well and clumps tightly for easy scooping. It does not put out dust when pouring into the litter box. I love the lightweight formula for ease in lifting and pouring. 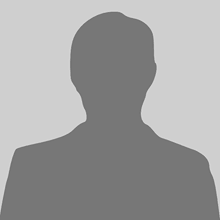 I was excited to receive a complimentary coupon from pinchme. to try Tidy Cats Lightweight Tidy Cats litter. This litter covers any bad smell. I can not smell when my kitty uses the litter box any more. It is super easy to clean as well. My two boys are a little picky if it doesn't clump they do not want to keep peeing in their box but tidy cats lightweight. An they have no issues now an my house smells so different not even close to a box. Tidy cat is my go to liter. I have a 5 month old kitten at home, and it has been a struggle to find a litter that we are happy with at home. Tidy Cats Lightweight solved all of the issues I had with the store brand litter we had been using. Any unpleasant smells are completely masked from the ammonia blocker, and leave the room where the litter box is located smelling good. It does not produce any dust and is extremely easy to clean up from the floor if my cat kicks litter over the side of the box. While I was not necessarily looking for a lighter litter, I was amazed at how lightweight the container was to take home from the store, which made it much easier to transport home and fill the litter box with. After this great experience, I am insisting that we only use Tidy Cats in our household! I received a coupon to try a free Tidy Cats litter through PinchMe. I purchased Tidy Cats Lightweight instant action cat litter, I like that this litter controls litter odor as our box is in a downstairs common area. It's great at masking odor quickly. I also like how much lighter this litter is and that it's easier to pour because of it's handy container and lighter weight. All 3 of my cats will use the box with this litter in use.